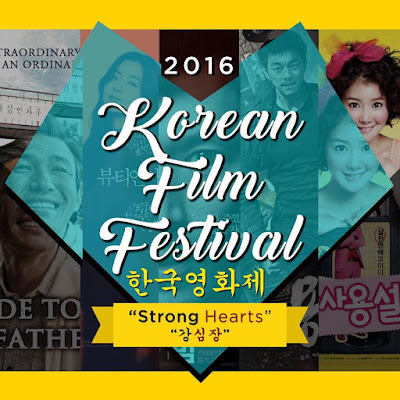 With the theme "Strong Hearts," Korean Film Festival 2016 is featuring five (5) films that capture the great willpower of a person to assert decisions even in the face of strong oppositions. 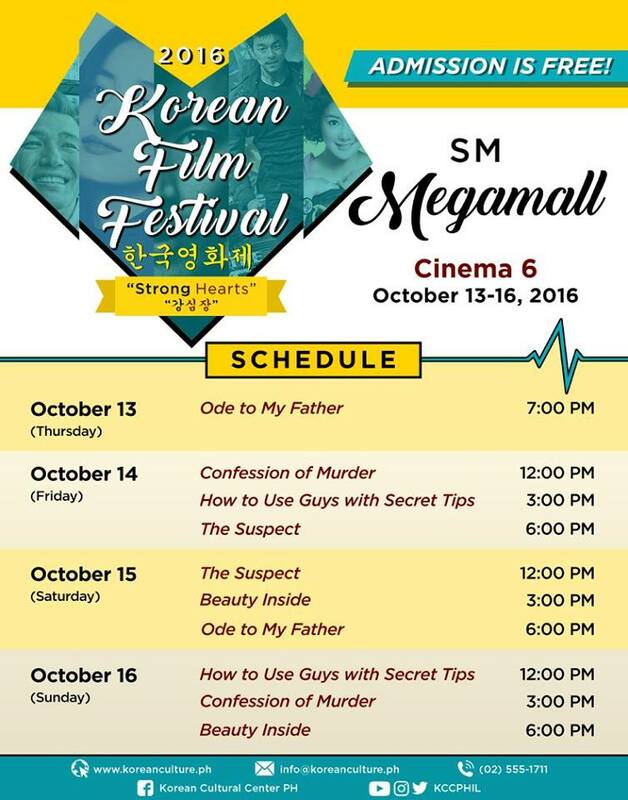 The films will be screened in its 6th and final leg at SM Megamall Cinema 6 on October 13-16, 2016. Admission is FREE! Just line up outside the cinema and get the free tickets from the Korean Cultural Center (KCC) booth at the entrance. Ode to My Father revolves around Deok-soo (Hwang Jung-Min), a hardworking man who does everything to provide for his mother and other siblings while setting aside his own ambitions. 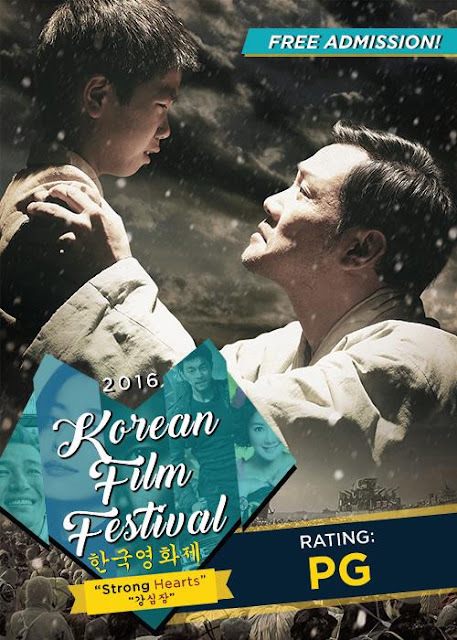 Deok-soo becomes the breadwinner of his family at an early age after his father and sister are tragically separated from the rest of the family during the evacuation of Hungnam in 1950. The Beauty Inside centers on Woo-jin (Kim Dae-Myung), a furniture designer who wakes up as a different person everyday regardless of gender, race, and age. He has resigned himself to a life alone until he falls in love with Hong E-soo (Han Hyo-joo). Since his physical identity changes frequently, he continues to visit her daily, acting as a new customer. Woo-jin finally musters up the courage to ask her out on a date. Knowing he will change once he sleeps, attempts to stay awake for as long as he can. However, Woo-jin no longer can fight sleep. He passes out and wakes up with a new face. Confession of Murder is about Lee Du-seok (Park Si-hoo) who published an autobiography titled I am the Murderer, claiming responsibility for a series of murders that took place 17 years ago and describing all his murders in great detail. His book becomes a bestseller because of the author’s charming looks and his claims of repentance for his crimes. 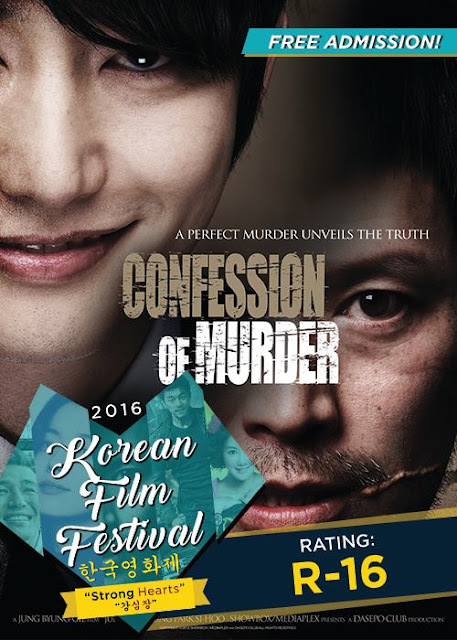 However, Detective Choi Hyeong-goo (Jung Jae-young), who was in charge of the investigation of all the ten murders, insists that Lee is in fact an imposter. Detective Choi chases Lee and challenges him to tell where the eleventh victim is, while Han Ji-Soo (Kim Young-ae), who is the mother of his last victim, seeks revenge with her family and friends. Out of the blue, another killer appears, casting doubt to whether Lee is the real serial killer. Gong Yoo plays as Ji Dong-chul in The Suspect. Ji Dong-chul is a former top North Korean operative who is now a defector after being betrayed by his own country. His life is thrown into chaos after he’s framed for the murder of his boss and is forced to go on the run, chased by General Min Se Hoon (Park Hee Soon). Aided by a feisty documentary maker (Yoo Da In), Dong-chul tries to get to the bottom of the assassination, linked to a mysterious formula which may or may not be for a new and deadly chemical weapon. 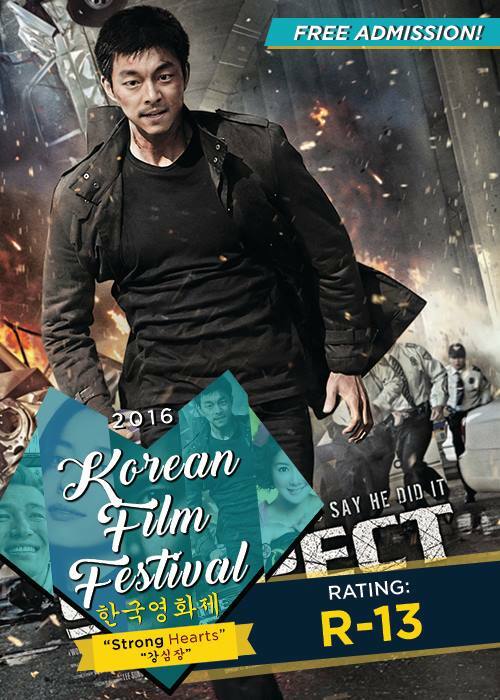 With Se Hoon and the director of national intelligence (Jo Sung Ha) on his trail, things get personal for Dong-chul when it becomes clear that the conspiracy also involves the killing of his wife and child years back. How to Use Guys with Secret Tips tells the story of Choi Bo-Na (Lee Si-Young) an assistant TV commercial editor for five years. Endless nights of overwork have caused her appearance to be a complete mess. After a grueling outdoor commercial shoot, her coworkers left back for Seoul without her. Stranded on a beach in the middle of nowhere, she comes upon a unique stall that sells various instructional tapes. While browsing the tapes, self-styled guru Dr. Swarski (Park Yeong-gyu) appears and urges her to buy his masterwork, "Manual on How to Use Men." Dr. Swarski tells her that it will give her the skills she needs to find success and happiness. After reluctantly following the instructions, Bo-na's life takes a drastic turn. She begins to experience professional success and men start wooing her including top hallyu star, Lee Seung-jae (Oh Jung-se). 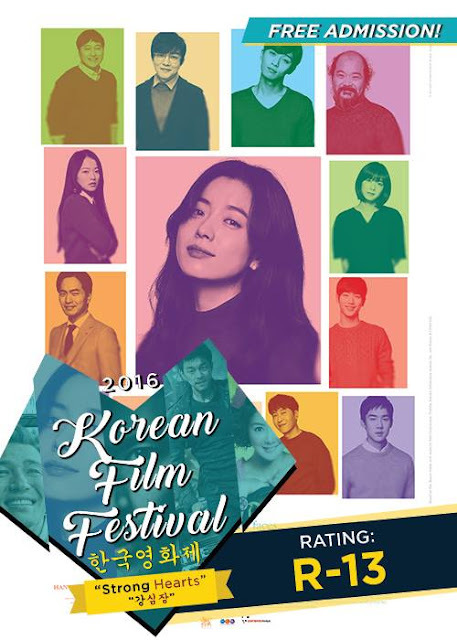 Korea Copyright Commission, Korea Tourism Organization, SM Cinema and SM Lifestyle Entertainment, Inc.
All films are with English subtitles and free of charge. For more details, contact the Korean Cultural Center at +632-555-1711, or email info@koreanculture.ph. You may also log on to koreanculture.ph.